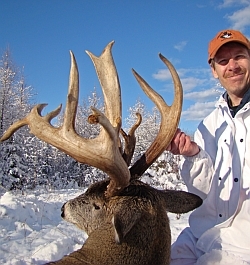 Our Whitetail hunting concession is located in the heart of Whitetail rich Saskatchewan, Canada. We have outfitting rights to over 500,000 acres of prime Whitetail habitat. Our area has it all! From the famed Saskatchewan farmland, to the thick, secluded Saskatchewan Boreal forest. 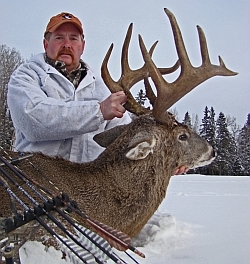 Mature bucks thrive in our vast, diverse region, giving our clients the opportunity to take their buck of a lifetime. Our 6,9, and 12 day hunts offer modern accommodations, lots of home cooked food, reliable transportation, complete trophy care, as well as the professional attitude, guides, enthusiasm, and pre-season scouting you expect and deserve when contracting your outfitted adventure. We run 1 main, modern camp from which we efficiently access our vast area. From here, our professional guides take our clients by truck and ATV, before shooting light, to their stands. Wind direction is key, as a result, daily stand locations will vary according to the wind direction. Deer activity, along with wind, will be our guides main considerations when choosing a clients hunting location for the day. All clients can anticipate hunting numerous stands over the coarse of their hunt. We maintain over 80 stands, well scouted, and strategically situated overlooking natural deer funnels and concentrations. Grain and alfalfa are then used to further entice our mature bucks. The stands themselves are mainly comprised of enclosed, quiet, ground blinds, hidden a comfortable distance from the main deer activity. Some elevated ladder stands are also used when the terrain and situation call for it. It is important for our clients to hunt from "dawn to dusk", as the vast majority of our bucks are taken in the middle of the day. 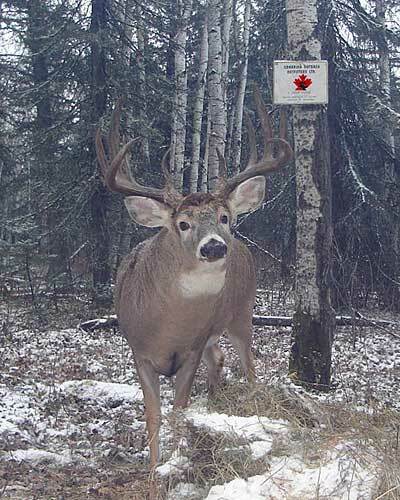 If one remains patient, 135+ bucks are the norm, however, our clients are encouraged to harvest mature deer, which generally score well over this mark. We enthusiastically scout our area year round. There is no substitute for spending 100's of hours on the ground walking and learning the country. This method can wear the soles off a few pairs of boots but when you find 'thee place, the time and effort are well worth it. 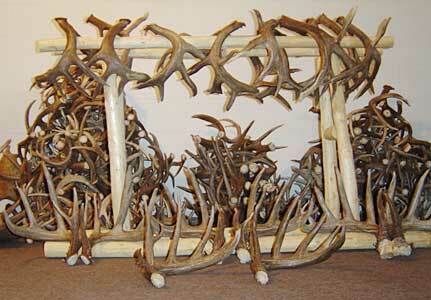 An exciting bonus from hours of scouting on foot most often comes in the way of shed antlers. Holding a freshly cast antler in your hands provides the hard evidence of yet another elusive Whitetail roaming the area. 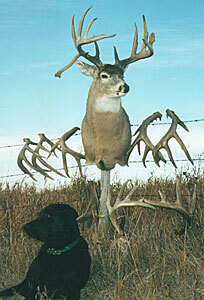 With that said, the only better proof of a Whitetail's existence is an actual photo. Employing numerous scouting cameras allows us to update our scouting efforts on a day to day basis which provides many "nice" surprises during the season. As they say, "a picture is worth a thousand words"!